ObamaCare is mandatory government Healthcare and a bridge to Obama’s Government-run Healthcare Monopoly. If government healthcare is Not mandatory then why did Obama and his congress add a tax fine to punish those who exercise their constitutional right to refuse ObamaCare? Translation: Anyone caught without acceptable coverage will pay a special tax and the IRS will enforce the federal government control which prevents your liberty to select the healthcare coverage you believe you need. Section 122 (pgs 26-30) “ESSENTIAL BENEFITS PACKAGE DEFINED” defines “acceptable” coverage which leaves you no healthcare coverage choices and makes carrying insurance for catastrophic events (such as Health Savings Accounts) illegal. 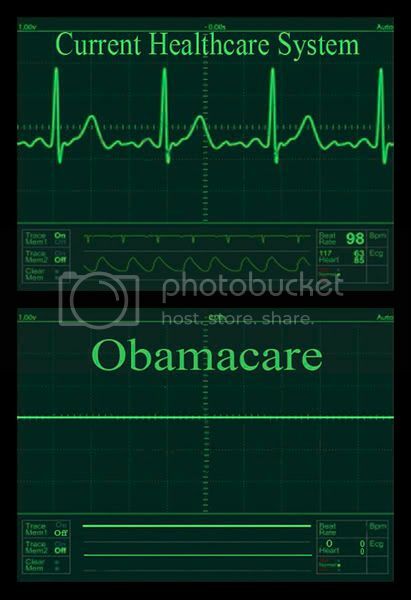 Will mandatory ObamaCare take care of you? (2) H.R.3200 Sec.102 ‘Protecting The Choice To Keep Current Coverage,’ basically states we can keep our private insurance only if we obey Obama and never change our private insurance plan and we cannot buy another private individual insurance plan when we change jobs. In effect, ObamaCare will eventually kill free market competition which has lowered costs. (3) Every American will be issued a National ID Healthcard which will track their eligibility for a specific health service. Note that the phrase, ‘which may include utilization of a machine-readable health plan beneficiary identification card’ is one way the government will track your health service eligibility. What happens in a emergency when you need life saving surgery and your government healthcard determines you are Not eligible for life saving health services? “ Since there are no profits in an accounting sense, by definition, in government, there is no mechanism for rewarding good performance and penalizing bad performance. In fact, in all government enterprises, exactly the opposite is true: bad performance (failure to achieve ostensible goals, or satisfy “customers”) is typically rewarded with larger budgets. Failure to educate children leads to more money for government schools. Failure to reduce poverty leads to larger budgets for welfare state bureaucracies. This is guaranteed to happen with healthcare socialism as well. For a healthy debate, it would be interesting to see President Obama debate Thomas J. DiLorenzo on the facts of government healthcare on national T.V. in the spirit of true American Democracy instead of the current atmosphere of nontransparent Thug-ocracy. Will Kool-Aid drinkers stop drinking the poison of Obama’s Obamacare? What constitutional authority gives Barack Obama the power to establish mandatory government healthcare? l. ObamaCare: The Absolute Power of Obama’s Kool Aid?